NETWORK FINALS: THE WORLD SERIES adjusted to 3.3, down 0.9 from last year’s Game 2. 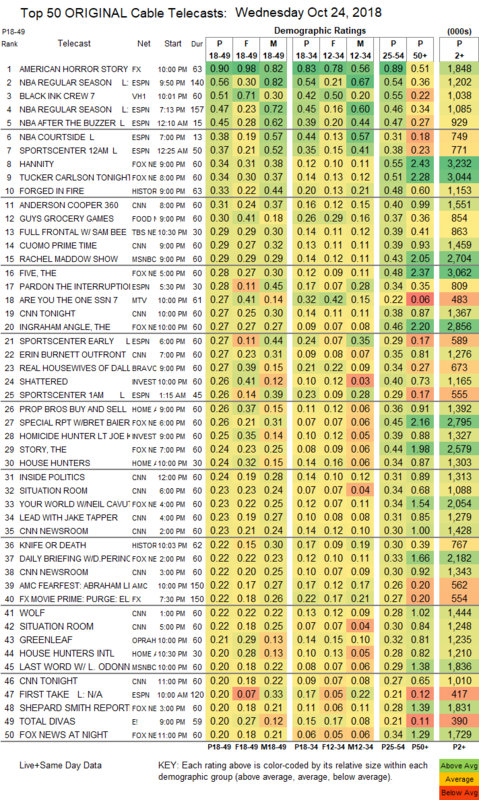 Elsewhere, there were 0.1 bumps for SURVIVOR and CHICAGO FIRE, while CHICAGO MED and SINGLE PARENTS lost the same. CABLE HIGHLIGHTS: FX’s AMERICAN HORROR STORY: APOCALYPSE topped Wednesday cable, down 0.03 to 0.90. ESPN’s NBA doubleheader was at 0.56/0.47. VH1’s BLACK INK CREW rose 0.08 to 0.51. Fox News’s HANNITY led cable news at 0.34/0.55/3.2M, with CNN’s ANDERSON COOPER 360 at 0.31/0.40/1.6M, and MSNBC’s RACHEL MADDOW SHOW at 0.29/0.43/2.7M. On History, FORGED IN FIRE gained 0.04 to 0.33, and KNIFE OR DEATH was up a tick to 0.22. Food Network’s GUY’S GROCERY GAMES climbed 0.04 to 0.30. 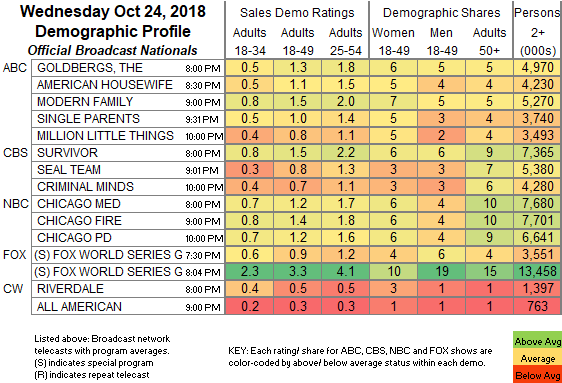 TBS’s FULL FRONTAL was up 0.04 to 0.29. MTV’s ARE YOU THE ONE edged up 0.02 to 0.27. Bravo’s REAL HOUSEWIVES OF DALLAS grew by 0.03 to 0.27, and WELCOME TO WAVERLY was at 0.10. On ID, SHATTERED rose 0.23, and HOMICIDE HUNTER was down 0.02 to 0.25. On HGTV, PROPERTY BROTHERS dropped 0.04 to 0.26, HOUSE HUNTERS lost 0.03 to 0.24, and HOUSE HUNTERS INTL was steady at 0.20. OWN’s GREENLEAF fell 0.08 to 0.21. E!’s TOTAL DIVAS gained 0.03 to 0.20. FXX’s IT’S ALWAYS SUNNY IN PHILADELPHIA ticked up to 0.18. El Rey’s LUCHA UNDERGROUND was steady at 0.02/80K.